One if my favorite things about the summer is enjoying delicious smoothies for breakfast. I love a good morning meal with eggs and kale, but smoothies are like fuel injecting your body with nutrients. Think of it as adding premium gasoline to a car for maximum performance. When you drink a smoothie, the nutrients are already broken down by the blades in your blender and easy for your body to absorb. Your body then gets to use the energy it would have used to digest your breakfast to get you through your day. My roommate and I have committed to having smoothies for breakfast for the entire summer! Basically, it means me and my trusty Vitamix® will be busy in the coming months and I will be posting a ton of new recipes. 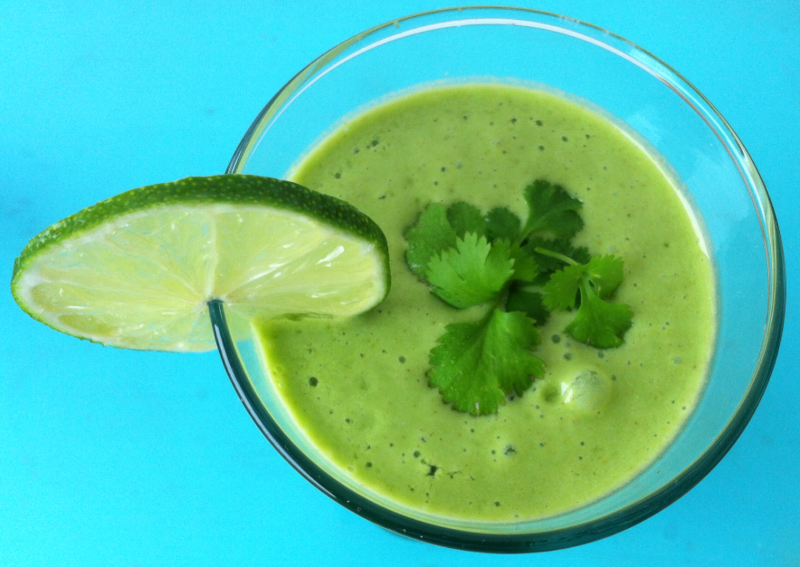 I came up with the cilantro lime coconut smoothie this morning simply because I needed to trim the cilantro plant we are growing on the terrace. I started thinking about my favorite green juice from One Lucky Duck called the Thai green. 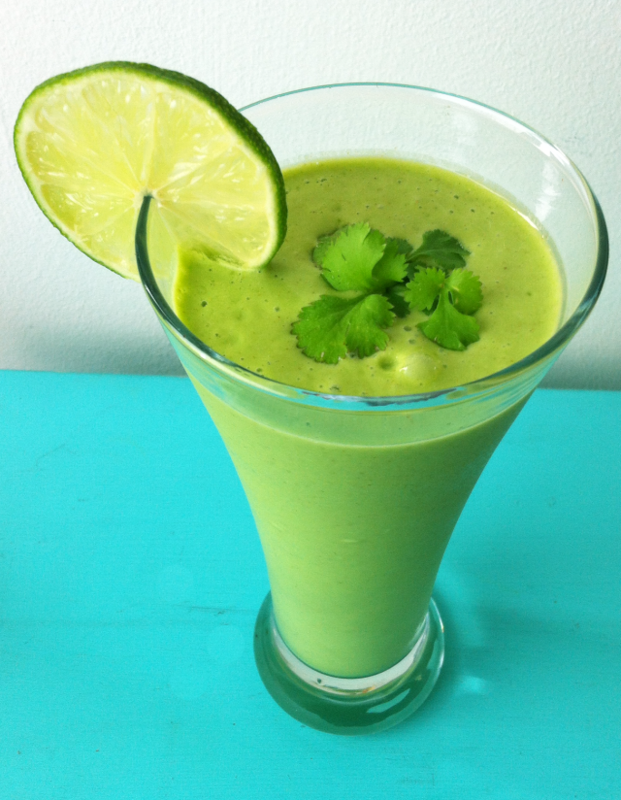 They use cilantro and pineapple with other various greens, it is heavenly and refreshing. So I figured, why can’t I create a smoothie inspired with similar flavors? I love using superfoods in my smoothies for extra energy. Today, I used Sprouted Chia Seed Powder. Yes, it is the same as the “Ch ch ch chia” commercials. Believe it or not Chia seed is extremely good for you. It is extremely high in Omega 3 fatty acids which are good for lowering cholesterol and heart health. Chia seeds are also high in insoluble fiber helping you eliminate toxins from your digestive tract. They absorb 12 times their weight in water helping you feel full and curb your appetite. They also have 6 times more calcium than milk! You can enjoy a dairy-free smoothie and still get your calcium for the day. One of my other favorite superfoods is coconut! It deserves an entire post dedicated to it and all of the amazing coconut products available. Don’t worry I am working on it! I just ran out of shredded coconut, so I used a tablespoon of coconut oil to add the tropical essence. Some of you might be scared by that. If you are thinking Where can I find coconut oil? Isn’t coconut very fattening? Know that coconut is special, the fat that it contains is not digested as all other fats. It goes straight to your liver and is converted into energy. I wouldn’t suggest running out and giving yourself the green light to chow down on an almond joy, but keep an open mind when you come across healthy products containing coconut. The recipe also calls for coconut nectar, you can use agave instead. But coconut nectar is a great sweetener for all uses. It has an extremely low glycemic index, much lower than agave in fact. Coconut nectar also contains vitamins, minerals, and amino acids. It is made from the sap found in coconut blossoms. The sap is collected and excess moisture is evaporated over time created a honey like consistency. If you can’t find it in your local health food store, It is sold online at Coconut Secret. I highly urge you to try it, especially if you are raw and vegan. Some agave nectars are heated above 115 degrees but labeled as raw. Be sure to research the brand you use if you are strictly raw, to ensure that your requirements are being met. I hope you enjoy this smoothie recipe. Cooking is a labor of love for me. I hope to help everyone achieve their best life possible and to educate anyone that is willing to listen. I appreciate you taking the time to read this post and hope that you will return in the future to see what I am creating next. Until then sending you all love and light! Put all of the ingredients into your blender. Start on a low setting and as the ingredients start to mix, turn up the speed until you reach high power. Keep the blender on high until the mixture is smooth. Garnish the glass with a lime slice for eye and enjoy! Note, if you are using fresh fruit, you can add 6-8 ice cubes to the mixture before blending to chill the mixture. I prefer to use frozen fruit for all of my smoothies, but make it with fresh fruit if you prefer. Omg. I never made the connection that chia seeds were the same chia on my Chia Pets! So . . . that means . . . I’ve been eating my pets?! What is coconut nectar? I have milk and oil. Is it just sweetener? Yes, coconut nectar is a low glycemic sweetener derived from the blossoms. Feel free to use agave or honey in this recipe if you do not have any on hand. You can click the link in the recipe to order coconut nectar from the supplier I buy mine from. Hope you enjoy the smoothie!